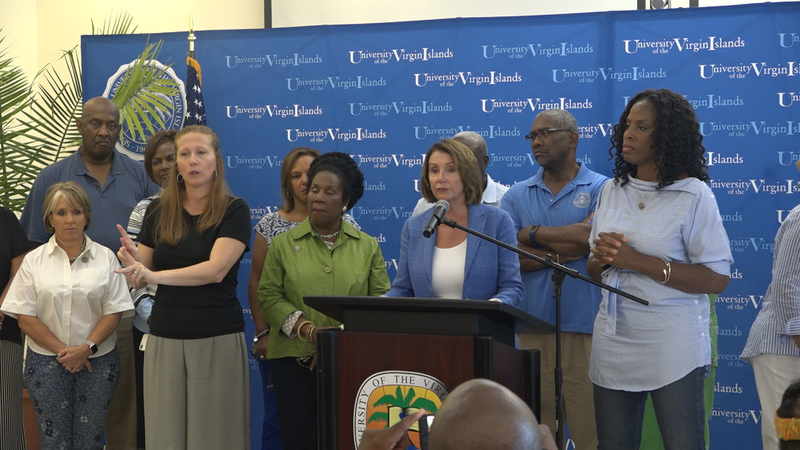 US Virgin Islands Congresswoman Stacey Plaskett (D-At Large) helped lead a Democratic group of her colleagues, including House Minority Leader and Former Speaker of the House Nancy Pelosi (D-CA), on a tour of St. Thomas and St. John. They visited Myrah Keating Health Center, Caneel Bay, Schneider Regional Medical Center and the WAPA Harley Power Plant. Plaskett said there were so many infratstructure issues on the islands before he storm that it made the recovery even harder. Now they’re pressing Congress and the administration for more help. Plasket said this past year Congress worked to change the Stafford Act to makes sure there is money there to make the territories more resilient so they can be prepared before the next storm. “We know that when we had the scare with Beryl coming through that we saw the vulnerability of the Virgin Islands and the amount of homes that still are compromised at this time so that means that we got to speed of the process and we have to get FEMA the tools to be able to do that,” Plaskett said Saturday at the press conference following the tour. Members said that they will continue to press their Republican colleagues for action when they return to Congress. They conducted this tour on their recess which is when they would normally return to their districts or visit with their families. They did ask some Republican lawmakers to join them many were unable to but Congresswoman Gonzalez Colon was with them in Puerto Rico.